HS# – IT’S VERY INTERESTING! With a gratitude for the linguistic control to Mr.Geoff Foster! In recent years in the world of fairy composition the Help-self mate genre (Help–compel mate, if we use the terminology of FIDE Albums) has become extremely popular. About 15 years ago this old but forgotten genre was noticed by Romanian problemists – and the well-known magazine Quartz (editor – Paul Raican) published a series of material and problems of this genre. As well as Raican, great activity in this direction was demonstrated by the excellent composers Vlaicu Crisan, Eric Huber, Dinu Ioan Nicula and Ion Murarasu. A very interesting tradition has already been established in the annual Romanian thematic TZUIKA tourneys, which are carried out regularly during the World Congress of Chess Composition and are dedicated solely to HS# problems. In regards to the Romanian activity, I have also expressed an interest in this genre, although it was not anything new to me, as for a long time I had known very well that HS# exists and in the early 1970s had discussed these issues with the famous German fairy composer, publisher and innovator, Albert Kniest. But my first problems of this type were published at the beginning of the 21st century and also at the same time I started to publish a series of articles dedicated to this genre. My first article “HELP-COMPEL MATE – A STIPULATION OF THE FUTURE”, was published in the magazine StrateGems, No. 32 (X-XII/2005). In that article I tried to define for the first time a number of aesthetic criteria for the genre, which of course were based on my own principles as nothing about these issues had previously been published. In the following years I also published a series of other materials dedicated to HS# – in USA, Serbia, Macedonia and France. I have composed about 300 problems of this type and have won a series of prizes in international competitions. For this reason, I have decided to publish a special article in Russia – as recently some noticeable activity in this direction by some Russian authors has been visible. Since so far there is no generally accepted, official theory of fairy composition, the reader must know, I repeat, that in this article I express only my own ideas and principles, which more or less are confirmed by the HS# -problems which I’m presenting as illustrations to this article. I want to specifically mention, that I’ll speak mostly about HS#-problems – i.e. 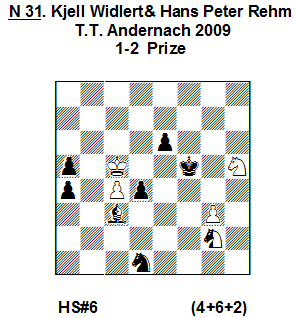 problems which finish in mate to the white King. 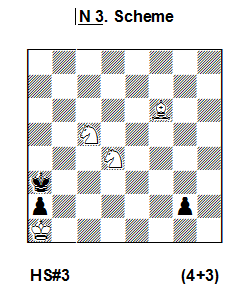 But it is well-known that there are some other kinds such as HS= (finishing in stalemate), HS== (finishing in double-stalemate), HSx (finishing in capture of a white piece) etc. Unfortunately, I am a bit short of space here to write in detail about all this variety. The genre of help-self mate was invented by the famous German composer Franz Palatz in 1922. The definition of HS# is as follows: „In a HS# in N moves White begins. Both sides help each other throughout N-1 moves with the aim of creating a position in which White forces self-mate in 1 move”. In other words, play during the first N-1 moves has a cooperative nature. But before the last (Nth) move the character of play dramatically changes and now a self-mate in 1 move is needed, in a position which was created by the joint efforts of both sides! Therefore, we can see that there are 2 phases in a HS# problem: the 1st one – cooperative phase in N-1 moves and the 2nd one – S#-phase in 1 move. This is how it looks in the 1st problem published in 1923 by the inventor of this genre: N 1 The 1st phase (N-1 = 2 moves): 1. 1.Rc5! Bh7 2.Bc4 Qg6. 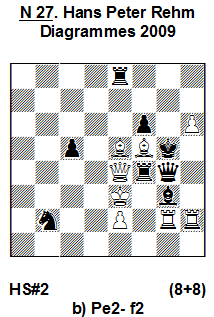 As can be seen, Black has realized the Turton theme, while White closes a line after a critical move of the Rook. 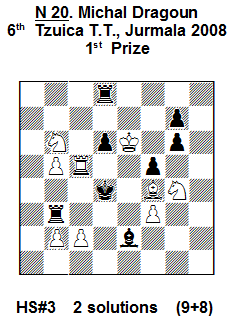 Thus, the 1st phase has ended and now the 2nd one, S# in 1 move, follows – 3.Sc2+ Qxc2#. N2. 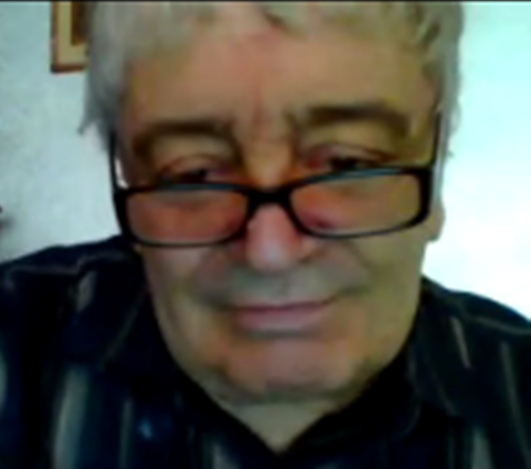 – this is the first problem by the inventor where he uses fairy pieces: 1.Gd2! 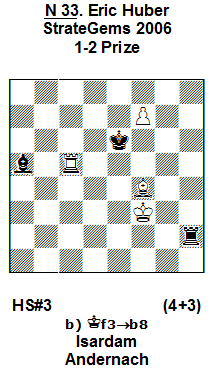 Rd8 2.Bc3 Sd7+ 3.Kd3 f5 4.Gd4 Kf6. 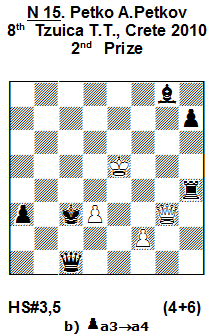 This is the end of the 1st phase and now follows: 5.Gg4+ Se5#! A very nice battery play! Palatz composed just 4 HS# problems before giving up this genre. For a long time, even after the 2nd World War, HS# problems were not popular – too few were composed, most were of poor quality, and most were also not correct. HS# had never received proper recognition, as many composers had considered that this genre was just a bad modification of helpmates, with the only difference being that in the final position a kind of “self-mate sounding” appears. Even Thomas Dawson, the trend-setter of the „fairy mode” of those times, did not pay any attention to this discovery. In spite of the incredible boom in recent years, a special book dedicated to this genre has not been published up to this day. I have prepared such a manuscript, but it is not yet clear where and when it might be published. By the way, later in this article in a very short form I offer to readers some of my theoretical concepts of HS# from that unpublished book. 1. In HS# problems a mate to the white King should be forced only as in standard self-mates! 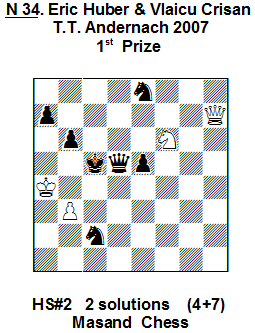 In a correct HS# problem this mate should be given exactly on the Nth move, which is the last move of the solution – not earlier and not later! 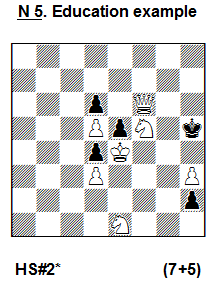 Thus, not only is Black not obliged to give mate, he is even forbidden from giving a voluntary mate – either during the process of the 1st cooperative phase, or at the last move! 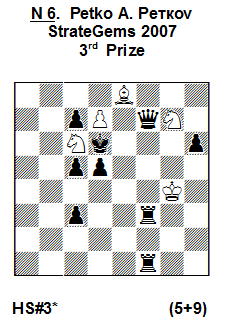 Let us see how this works on the simple scheme N 3 – Here, after some free move by White (e.g. 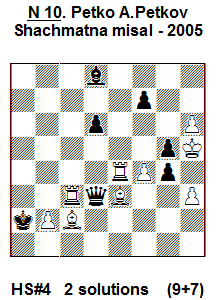 1.Ве5), Black, at first glance, can seemingly give mate by 1…g1=R# or 1…g1=Q#. 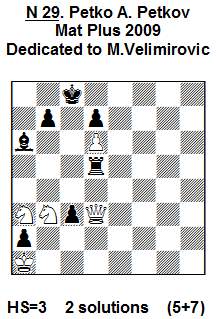 But Black is not allowed to do this, because voluntary mate is unacceptable; the only possibility is forced mate! This is how it can be achieved: 1.Sc6! g1B 2.Bc3 Bd4. White and Black have realized the 1st, cooperative phase. 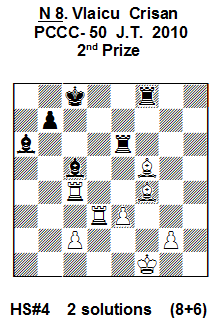 The next one follows, which is S# in 1 move: 3.Bb2+ Bxb2#. A logical question: why can’t we solve the problem in another way, such as, for example: 1.Sе6? g1B 2.Bc3 Bd4 3.Bb2+ Bxb2#?? 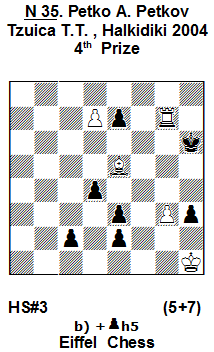 The answer: because Black is not forced to give mate here, he can answer with 3…Kb4! Such a move is a very original and interesting defense in this genre! As the final play fully meets the requirements of self-mates, Black is required to defend himself from mate, if such a defense exists! That is why White plays 1.Sc6! 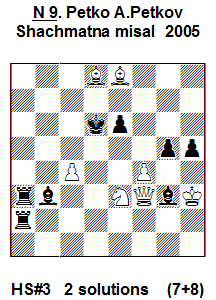 , taking away the possible escape (defense) to b4 by Black on the last move! 2. Cooks and duals in play are totally unacceptable in HS# problems! But, as in standard help-mates, it is not only possible but even desirable to realize the idea in 2 or more thematic solutions (phases) or, eventually – in set-play and real solution. In this regard, the cases we should first pay attention to are those in which cooks are possible in fewer than N moves. 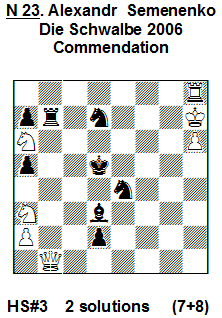 In the scheme N 4 the author’s (thematic) solution is: 1.Qb6! e1B 2.Sf2! Bc3+ – the end of the 1st phase. The 2nd one follows: 3.Qb2+ Bxb2#. But here it is possible to realize HS# in 2 moves: 1.Qb6 e1Q+(or 1…е1=R+) – only after this 1-move cooperative phase follows the 2nd one: 2.Qb1+ Qxb1# (respectively 2…Rxb1#). Thus, here we have a cook in 2 moves after 1.Qb6! If we had a stipulation HS#2 from the beginning, the problem would still be incorrect, as the aim would be reached by 2 (dual) methods – after promotions 1…е1Q+ and 1…e1R+. 3. If there is set-play in a HS# problem it will start with a black move. But it will be impossible to keep this play (because of zugzwang), so in the solution White starts and realizes the real play. 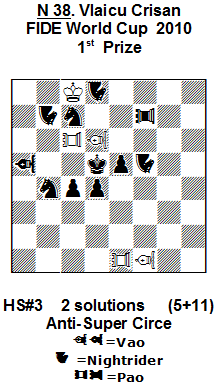 In N 5 the set-play starts with 1…h1B+! 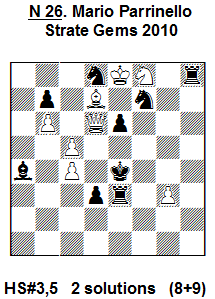 – It is obvious that the first, cooperative phase, consists of 1 black half-move only! The 2.Sg2! 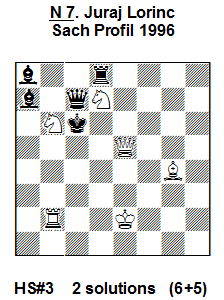 follows and Black, who is in zugzwang, has to give mate: 2…Bxg2#. But White has no waiting move, so the plan must be changed: 1.Sf3! h1=S! 2.Sg3+ Sxg3#. Of course, you will have already noticed that the problem can’t be solved after 1.Sg2? h1=B 2.Qe6? – Black is not forced to give mate here as he has a defense – 2…Kg5! It is interesting that up till now there have not been many composed HS# problems with set-play, but there are many possibilities. As in other genres, both phases should be expressed in a most interesting and full way; here, set-plays of 1 move would look very primitive. 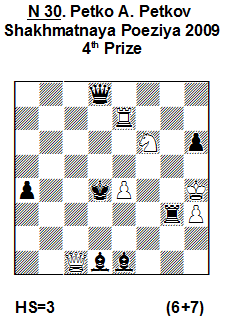 In N 6 promotions of the white pawn are combined with reciprocal Anti-Bristol interceptions of the black Q and R, while one more thematic line-opening and anti-dual is demonstrated by Rf3. In the beginning: 1… Rh3! (1…Rd3?) 2.d8=S! Qf2!! 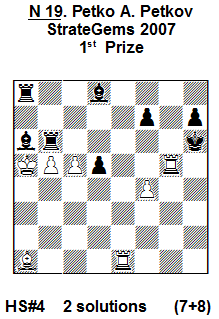 3.Sf5+ Qxf5#; but there is no waiting move, so the play must be changed: 1.d8=B! Rd3! (1…Rh3?) 2.Bg5 Rf6 3.Bf4+ Rxf4#. 4. HS# problems with a fractional number of moves, such as 2.5, 3.5, 4.5 etc., are also possible. This means that Black starts the play, after which everything is the same as for standard HS# problems, where the first move is done by White. For example, if we have a set-play in a HS#2.5 problem, it means: а) set-play is in 2 moves with the 1st move by White; b) real play is in 2.5 moves with the 1st move by Black move, as it is impossible to keep the set-play because of zugzwang. The summary of my principles will now follow – I replicate it from my already published article in “StrateGems” No.32 (2005). Of course, some other interpretations are also possible. Unfortunately, nothing about these questions were said by the inventor Franz Palatz – only looking at his first problems can we guess to some extent, what it was the famous composer had thought or dreamed. I am deeply convinced that the HS# genre is a completely independent genre in fairy composition, with its own thematic ideas, and which promises a very large range of interesting practical possibilities. Although this genre to some extent can be considered as a compilation of helpmates and self-mates, in reality this combination has a unique specificity and significance. Consequently, the most common, general aesthetic criterion can be expressed as follows: in a high-quality HS# problem a tricky and original thematic complex should be shown in maximally economical and aesthetic form. At first glance of such a problem it should already be clear, that the content has such elegant form, that it can’t be presented either in a helpmate, or in a self-mate, or in any other genre of composition! A logical question here: on what basis can we expect such a uniqueness and independence of HS# problems? The answer is easy and interesting at the same time. 1. Of course, a special nature of the play in a HS# is determined by the particular structure of its content – the 2 contrasting phases of play: cooperative in N -1 moves and inverse in 1 move. And as such content does not occur either in H#, or in S#, the composer should specially emphasize this feature of HS# problems. If a HS# problem looks more paradoxical in comparison with a helpmate or self-mate (its content and construction), then it is better. On the contrary – if a HS# problem shows a modest or banal idea that has already been met many times in H# and S# in good constructions, de facto such an HS# loses its sense of content and existence. 2. In HS# it is possible to significantly “retire” from the banal cooperative schemes for one very important reason. The fact is that in HS# problems you can safely use very strong material – Queen, Rooks, Bishops etc. In helpmates it is almost impossible to compose problems with such an abundance of white material because of unavoidable cooks. And exactly this possibility of unlimited use of powerful white material in HS# (and this is largely true for the black material as well!) opens up opportunities to realize new and complicated strategical complexes. The composer should use this chance to a maximally rational degree, working in 2 ways: theoretical, which outlines the possible combinations of the motives (synthesis), and practical, when the abstract ideas are brought to actual realization. 3. It is easy to determine why a high-quality HS# problem should be significantly different from help- and self-mates, where at first glance thematic complexes have partially analogical motives, as they occur in HS#. In a self-mate the play is direct only – from the first till the last move. 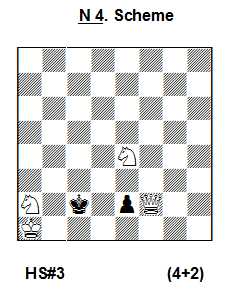 Moreover, especially in problems with a small number of moves (2,3), it is necessary to almost completely restrict the mobility of the white King, and very often – of the black King as well. In a HS# there are conditions for a much greater freedom and activity of both Kings, and this fact should be fully used! All of this doesn’t mean that HS# is much better than H# or S#. On the contrary – such comparisons are even completely inappropriate. I just want to emphasize that HS# is a sufficiently independent genre. The limitless possibilities for composing in this arena are not an estimation on the basis of theoretical predictions, but have concrete practical reasons: here we work with a new structure of the content and with new, more powerful material. In these days it is already possible to check such problems with a computer – approximately in 5-6 moves and even longer. By the way, strangely enough, the computer testing of HS# problems is not as fast as, let’s say, of helpmates or even self-mates. So, don’t fall into composing of too long HS# – it would mean first of all a risk of primitivization of the content and on the other hand – impossibility of computer testing! Let’s look at some relatively recent problems, where very brightly is shown the most important feature of good HS# problems – the presence of original and even paradoxical synthesis of already known themes and ideas, presented in surprisingly good constructions. N 7. I. 1.Kd3! Bxb6 2.Be2 Kxd7 3.Qe6+ Kxe6#; II. 1.Ke3 Rxd7 2.Re2 Kxb6 3.Qb5+ Kxb5#. 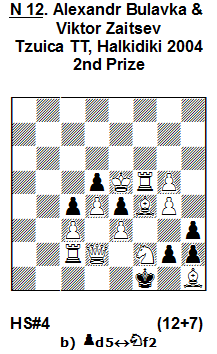 Amazing “aristocrat”, where every half-move is thematic, with dynamic play of both Kings. N 8. I. 1.Bc7! (A) Bxe3 2.Rd7! (B) Bf2 3.Bh3 Re3 4.Bd6+ Bxc4#; II. 1.Rd7! (B) Rxe3 2.Bc7! (B) Re2 3.Rc3 Be3 4.Rd6+ Rxf5#. Wonderful complex, demonstrating masked white battery-creation, unpins of black and white pieces, Annihilation (Pe3), Grimshaw (e3), cycle AB-BA in ODT form. N 9. I. 1. Sf1! Bd1 2.Sxg3! Bxf3 3.Se4+ Bxe4# ; II. 1. Qb7! Bf2 2.Qxb3! Bxe3 3.Qb6+! Bxb6#. Zilahi theme on the background of reciprocal Annihilation of 4 pieces – 2 white and 2 black – with a goal – creation of masked black batteries. N 10. I. 1.Bc1! Qg3!! 2. Rf3! gxh3 3.Bd3! Kb3 4.Bb1+! Qxf3#; II. 1.Rb4! Qh7!! 2.Bf5! gxf4 3.Rd3! Kb1 4.Ra3+! Qxf5#. White Indian theme in combination with black-white Bristol, double line-opening – for the white and black pieces. N 11. 1.Rf5+! Kg2 2.Rf2+ Kg3 3.Rg2+ Kf4 4.Rg5 Rd6+ 5.Kc5 Ra6+ 6.Kd4 Ra2 7.Bd2+ Rxd2#. A unique combination – white and black Rook-Rundlauf + white battery creation! N 12. a) 1.Bg3! 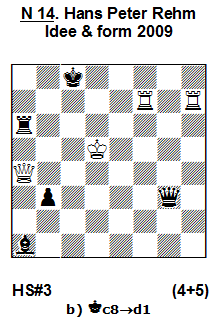 g1R 2.Bg2+ hxg2 3.Kf4 h1Q 4.Bh2 Qxh2#; b) 1.Kxe4! g1B! 2.Bf3 h1S 3.Be5 h2 4.Rf4 Sg3#. 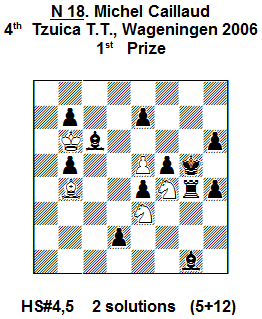 Paradoxical realization of black Allumwandlung in zugzwang form – one of the pieces is walled in, but the other gives mate! 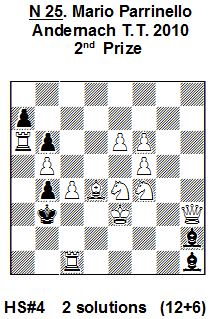 N 13. a) 1.Ba1 Bg2 2.Re5 Rf3 3.Kd5 Kg7 4.Rh5+ Rc3#; b) 1.Rxc5 Rh3 2.Be5 Bf3 3.Kb3 Kh5 4.Bg7+ Bd5#. Double Indian theme in combination with Grimshaw is realized from both sides! N 14. a) 1.Rb7! Rh6 2.Rhd7 Qg6 3.Qc6+ Qxc6#; b) 1.Rc7! Bh8 2.Rhe7 Qg7 3.Qd4+ Qxd4#. White realizes RR-Bristol two times, black answers with Turton theme! Unbelievable construction with 9 pieces only! 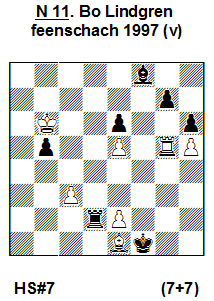 N 15. a) 1…Ra4 2.Qg5 Kb4 3.Kd4 Qe1 4.Qb5+ Kxb5#; b) 1…Ba2 2.Qg7 Kb3 3.Kd5 Qc7 4.Qb2+ Kxb#. Black Indian theme with black King as forward battery-piece, indirect white batteries K/Q, created after ambushes of the white Q! N 16. I. 1.Qf1 Ba4+ 2.Kc4 Qf7 3.Sfd4+ Rxd4#; II. 1.Qc8 Rb2+ 2.Kxc3 Qh3 3.Sed4+ Bxd4#. 4-pieces pin – 2 white and 2 black (masked) using the both Q! It should be noted also, that the model mates here are obtained after realization of black Grimshaw on “d4” square – an amazing motive! N 17. I. 1…a1=Q! 2.Rd6 Qa2 3.Bc6 Qxd5+! 4.Kxd5 b1=B 5.Bc5 Ba2#; II.1…b1=R! 2.Bc3 Rb4 3.Bd3 Rxd4! 4.Kxd4 a1=S 5.Rc4 Sb3#. 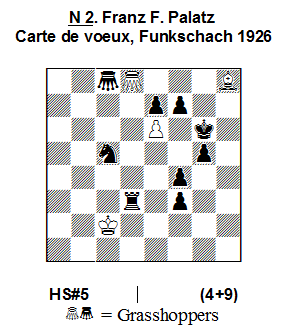 Here the black demonstrates: Allumwandlung, Annihilation of pawns d5/d4, sacrifices in style of Zilahi. White realizes 3 self-blocks in each solution. Model mates! N 18. I. 1…d1=R! 2.Kc5 Rd4 3.Sd1 Rd3+ 4.Sf2 Re3 5.S2h3+ Rxh3#; II. 1…d1=S! 2.Ba5 Sf2 3.Sc2 Sd3+ 4.Sd4 Sc5 5.Sde6+ Sxe6#. Black masked battery creation after promotion with the following transformation, using double-unpin of the white S (Dentist theme)! N 19. I. 1.Re7! 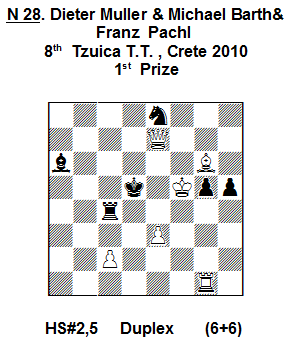 Bc8+ 2.Ra7 Rb7+ 3.Ka6 f5 4.Bg7+ Rxg7#; II. 1.Be5! Rbb8+ 2.Bc7 Bb7+ 3.Kb6 d4 4.Rh1+ Bxh1#. 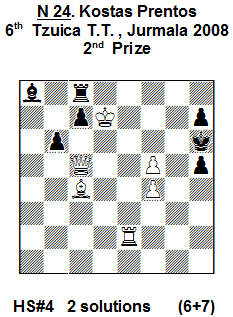 Reciprocal play of 2 black batteries leads to the Indian theme + Zabunov, Grimshaw, pin of white pieces and line-opening for white! N 20. 1.Bxd6! Ra3 2.Be7 Ra6 3.Rc4+ Bxc4#; II. 1.Rxf5! Bf1 2.Rf7 Bh3 3.Be3+ Rxe3#. Pins of white S are realized after Annihilation of pawns d6/f5, than white blocks follows with an excellent interchange of functions of white and black pieces! N 21. I. 1…Rd6! 2.Re1 Sxf4 3.Qh3+ Sxh3#; II. 1…Qc7! 2.Sfe2 Sxe5 3.Sxf3+ Sxf3#. Direct unpin of the white pieces and masked unpin of the black S, which later creates batteries on 2 lines. N 22. 1.Kc3! Kxe5 2.Sg3 Rb4 3.Bc4 Rb2 4.Qd6+ Kxd6#; II. 1.Kc4! 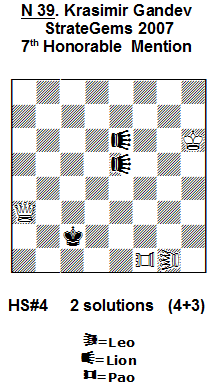 Kxe4 2.Sd7 Bc3 3.Bb3 Bb4 4.Qf3+ Kxf3#. Great play by both Kings. Impressive is also play of both S – one is captured, the other one after unpinning opens a line for the black piece, which shows bypass maneuver, White blocks squares around the King! Model mates! N 23. I. 1.Qxb7+! Kd4 2.Qxd7+ Kc3 3.Qg7+ Sf6#; II. 1.Qxd3+! Kc6 2.Qxe4+ Kb6 3.Qg6+ Sf6#. The effective realization of the Zilahi theme – in one phase the whole black battery is destructed, but the other one gives mate, in the other phase – vice versa. Good blocks of white Q, leading to model mates. N 24. I.1.Re7! Rh8 2.Bg8 Bd5 3.Ke8 Bxg8 4.Qc6+ Be6#; II. 1.Bb5! 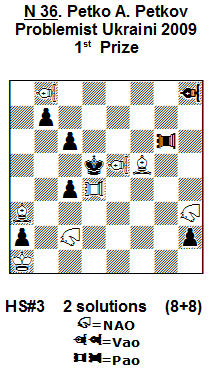 Bh1 2.Rg2 Rg8 3.Kc6 Rxg2 4.Qf8+ Rg7#. A very interesting modification of Indian theme which follows after sacrifice of white piece on the square of intersection! Also, good white blocks and model mates are shown. N 25. I. 1.Sd5! Bb8 2.Sc7 Bxe4 3.Kf4+ Bf3 4.Ke5 Bxc7#; II. 1.Sd6! Ba8 2.Sb7 Bxf4+ 3.Ke4+ Bg3 4.Kd5 Bxb7#. Reciprocal play of the black Bishops – critical moves, pins, Annihilation motives. 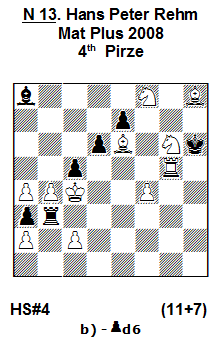 It is interesting that in the final White performs quiet – zugzwang moves. N 26. I. 1…Rh3! 2.Sxe6 Rhxg3 3.Sf8 Rg8 4.Qf4+ Kxf4#; II. 1…Bb3 2.Bxe6 Bxc4 3.Bd7 Bb5 4.Qd5+ Kxd5#. 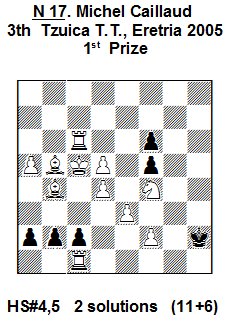 Original double-Annihilation (of the white and black pawns), switchback of the white and black pieces, model mates. N 27. a) 1.Bh7! Qf5 2.Qxf4+ Qxf4# (1.Qxf4+? Bxf4+! ); b) 1.Rh3! Bh2 2.Bxf4+ Bxf4# (1.Bxf4+? Qxf4+!). An interesting realization of Umnov theme on the background of 2 half-pins! N 28. The 1st phase: 1…Rc5! 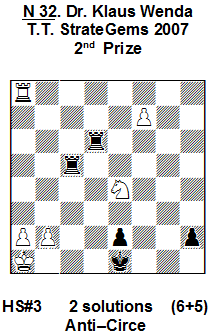 2.Rd1+ Bd3+ 3.Qe4+ Kd6#; the 2nd (black) phase: 1…Rxg5! 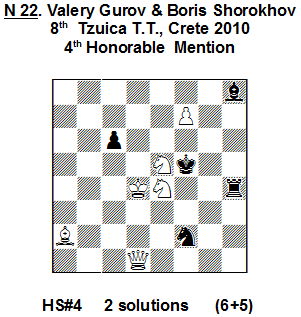 2.Bc8+ Qd7+ 3.Sd6+ Kf6#. Royal battery creation, double pins of the white and black pieces, Meredith form! N 29. I. 1.Sa5! Rxa5 2.Qxa6 Rxa3. The end of the 1st, cooperative phase. 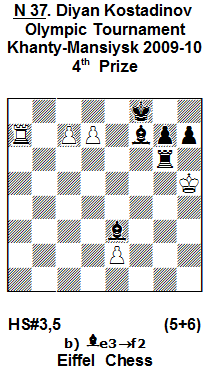 The 2nd one follows, where white forces self-stalemate in 1 move: 3.Qa8+ Rxa8=. Analogically: ІІ. 1.Sc4! Bxc4 2.Qxd5 Bxb3 3.Qg8+ Bxg8=. The thematic complex: Zilahi theme, black-white Bristol, Annihilation, model stalemates. N 30. I. 1.Sh5! Rc3+(1…Rb3+?) 2.Sg3 Rc4 3.Qe3+ Kxe3=; II. 1.Rg7 Rb3+(1…Rc3+?) 2.Rg3 Rb4 3.Qc5+ Kxc5=. 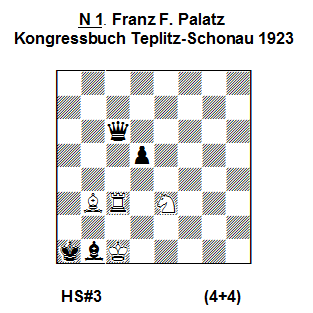 Model stalemates with 3 white pinned pieces, play of black R/B battery, black masked battery creation on the 4th rank. а) Thematic richness of content is closely connected with the filling of every half-move of the solution with some thematic motive! Thus, a good HS# problem strictly follows the principle of time economy – redundant, non-thematic, “idle” moves are not used! This also means that a solution should not be extended (with the aim – to increase the difficulty) by technical half-moves, which are not consonant with the central theme. Btw, this requirement essentially distinguishes a good HS# problem from the series ones (Ser.H#, Ser.S# etc), where the theme is almost analogical, but with a long play containing an abundance of technical moves. b) In all phases of the solution every white and black piece should participate – playing either a thematic or a technical function. If in some phase one or more pieces do not play (are redundant), then this is a significant minus of the problem! The economy of material in this genre is so important, that usually a composer must strive to express his idea with less than 15-16 pieces, using 17 or more pieces in some exceptional cases. In the other words, striving to present a problem in Meredith or even miniature form is a sign of great skill of the author! 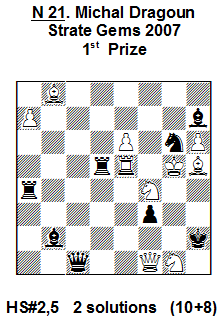 c) Rough, non-thematic captures of pieces and pawns are weaknesses; a check on the 1st move is allowed only if it is thematic. Model mates are not a mandatory requirement and can’t give any significant advantage to the problem if the strategy is primitive. Violation of aesthetics with the aim of building some tasks or alphabetical problems is not recommended, although such problems can be met in today’s tourneys. It is well-known that a number of HS# problems also contain fairy conditions. As a modus of HS# means the aim of the play (Stipulation), here we can also use some additional fairy conditions e.g. Circe, Madrasi, Eiffel, Einstein, Super Circe, Andernach, Anti-Andernach, Maximummer and so on, and also their combinations e.g. Circe+Madrasi etc. This way we get the usual fairy problems combination of Stipulation + Condition(s). Of course, there are also no limits for the use of different kinds of fairy pieces. Having no possibility to show here all the great practical opportunities, I will present just 10 examples, but these are works by the famous masters. The reader, probably, might be easily convinced that all these problems meet the basic principle of using fairy pieces or conditions – it always should be done in accordance with the theme of the contents and something more: try to show (or emphasize) as much as possible the weight, specificity and beauty of the fairy element! N 31. 1.nBa1! Sb2 2.Kxd4 Sxc4+ 3.Kd3 nBh8!! 4.Sf6 Ke5 5.Kc3 nSge3 6.Se4+ Kxe4#. 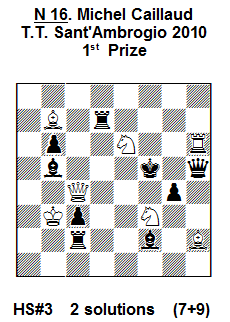 Very interesting role of the neutral B, which realizes Indian theme 2 times – with the help of the white and black S! N 32. I. 1.f8=Q! Rc8 2.Rxc8(Rh1) Rd2 3.Qb4 Rd1#; II. 1.f8=B! Ra6 2.Rxa6(Rh1) Rc3 3.Bb4 Rc1#. Very original realization of Zilahi theme. Exceptionally beautiful self-unpins of the black R.
N 33. a) 1.f8=R! Kf5 2.Bh6 Rh5 3.Kf4+ Bd2#; b) 1.f8=B! Kd6 2.Rc8 Bb4 3.Kc7+ Rc2#. Excellent miniature, where mates are given with very interesting use of fairy conditions. N 34. I. 1.Qe4! Qa8 2.Sd7(wPb6,wPe5)+ Qc6(bSd7,bPb6,bQe4)#; II. 1.Qd7! Qd1! 2.Se4+ Qd4(bSe4,wPe5,bQd7)#. Interesting play of both Q, which demonstrates the essence of fairy condition. N 35. a) 1.d8=R! e1=B! 2.Rxd4 c1=Q! 3.Rh4+ Bxg3# (not 2…c1=R? 3.Rh4+ Bxg3+ 4.Bb2!! ); b) 1.d8=B! e1=S! 2.Bxe7 c1=R 3.Bg5+ Sf3# (not 2…c1=Q? 3.Bg5+ Sf3+ 4.Rc7!!). Black Allumwandlung in combination with battery-creation, white promotions, Annihilation of pawns d4/e7 and anti-dual with thematic paralysis! N 36. I. 1.NAa6 PAf6 2.PAh4 PAxa6+ 3.VAf4+ Ke5#; II. 1.VAa7! PAg7 2.VAg3 PAxa7+ 3.PAf4+ Kd4#. Thematic sacrifices of the white NAO, VAO with attraction-motives, unpin of white pieces, realization of “Chinese-Indian” theme, anti-batteries, line-closings, model mates. N 37. a) 1…Bc4! 2.d8=B! Rg4 3.c8=Q! Fxe2 4.Bb6+ Rc4#, b) 1…Bd5! 2.d8=S! Rc6 3.c8=R! Rc5 4.Se6+ Bxe6#. Allumwandlung with white battery-creation, “Miloslava”-theme with black battery transformation, line closings with Eiffel-effects. N 38. I.1.Kxd8 (Ke2)! Kxc6 (Kc3) 2.PAxe5 (PAc8) Nbxd6 (Na4) 3.VAxc4 (VAe5)+ Kb3#; II. 1.Kxb7 (Ke2)! Kxd6 (Kf4) 2.VAxc4 (VAb8) Nxc6 (Nh8) 3.PAxe5 (PAc4)+ Kg5#. Amazing dynamics in creation and play of the thematic batteries in ODT. N 39. I. 1.PAf7! LIg8 2.PAh7 Kb1 3.Qb3+ Ka1 4.LEg7+ LIh8#; II. 1.Kh5! LIe4 2.PAf6 LIg7 3.PAh6 Kb1 4.LEg6+ LIh7#. Very non-standard Chameleon-echo with model mates in miniature form. N40. I. 1…Rg7! 2.Rb4 2.Sc6+ 3.Kxc6-d4 Kxb1-a3 4.Rb7+ Rxb7-b4#; II. 1…Bf6! 2.Bb4 Sc8+ 3.Kxc8-d6 Kxc2-a4 4.Bc3+ Bxc3-b4#. A task with play of 6 different batteries, showing typical dynamic effects of the fairy genre. In my opinion, every modern composer should “adopt” the wonderful genre of HS#. This is especially recommended for young composers who are interested in the fairy genre. By the way, some very interesting modifications of this genre have appeared, but we will speak about them some other time. Accordingly to my private statistics, there are currently about 4000 composed HS# problems, and this number is growing rapidly day by day. Today HS# is the most popular fairy genre! The good thing is that HS# problems can be tested using practically any of the modern computer programs. I will be pleased to answer questions from any reader who is interested in this topic. 9 Responses to HS# – IT’S VERY INTERESTING! Хорошая статья, но есть пожелания касательно языка. Например, в предложении В ней я постарался впервые дефинировать ряд эстетических критериев этого жанра вместо слова дефинировать лучше использовать слово определить. Вместо реципрочными в цитате превращения белой пешки сочетаются с реципрочными Анти-Бристольскими перекрытиями желательно написать русское взаимными. Кстати, этот термин встречается не раз в тексте. В фразе формирование белых индиректных батарей – индиректных означает косвенных. Встретил несколько опечаток, но это не так важно для понимания. Другое дело, что применение иностранных слов ухудшает читабельность текста. Извините за замечания. Статья в самом деле замечательная и поучительная. Even though I cant read a word, I welcome this, as in my copy of Ural’s Problemist, this article had diagrams with invisible squares ! (Perhaps to improve visualisation skill). Now I can see the problems and solutions in easier mode ! Thanks for being so responsive person!! Nice to hear that at least something works for you! 🙂 But seriously, I’ll translate it into English as well. Just need some more time as this one is the longest one for now. Usually I’m trying to put all the info in 2 languages at once, but this one had taken a long time to prepare even in one language, and I had a great wish to update the info at the site… Also, the previous article – ser-hs# – I have in English only. So, have kind of ballance 🙂 Hopefully, I’ll translate the both into the 2nd language in June. The possibilities of the human mind are unlimited ! This morning I’ve got the language correction to my version (published at midnight) from Geoff Foster. Dear Geoff, thank you very much for such a great and quick work! This is a welcome article. Already a good number of Helpselfmate problems have been published, many of them winning prizes. But as Mr.Petkov feels, there is still good scope of originality. I am sure many outstanding problems are yet to be composed. I am sure the present tourney of this site will identify many such problems ! Thanks Pekov ! A great work of Petko, who disseminates very professional this genre. For me, this genre arose from the need to compose a correct h#n with neutral pieces, to which my good friend Vlaicu Crisan found always cooks. I managed to remove doubles just after I turned that h#n in to a hs#n.